When I started testing my little blue Fiat 500e a couple of months ago, I thought, that as part of my EV awareness, I’d attend meetings of some electric car enthusiast organization.I pictured meeting in a place like an old Hof Brau, and standing in the parking lot before going inside for beers and roast beef, looking over each others’ cars in the fading sun. What I was picturing was the car club of the past. I met the Corvair owners club years ago that way. Today, the action is in three places, for me. The first is at work, where I’ve created the Electriccars channel on Slack–our company instant messenger application. We have 12 members–most of the electric car drivers in the company. We post photos, talk about range and what we want to buy someday, and we’re pretty well represented. We have drivers of Teslas, Leafs, Volts, A Ford Focus Electric and a Fusion Hybrid, BMW i3s, and a couple of us with Fiats. Here’s our charging array. Fidelio, my blue Fiat 500e, is at the top of the picture, because my battery is full, and I’ve moved aside to let another driver charge up. With 15 EVs and 6 spots, it’s the only way to make it work. I’ve had numerous conversations in the hallway and in our “Cantina” food and party area. One guy proudly showed me his Volt app, where he could get lots of stats on his mileage and driving efficiency. Another wanted to talk about the differences between the different EVs on the market–or the difference between living with a plug-in hybrid versus a pure electric. Another is eagerly awaiting his opportunity to put money down on a Tesla Model 3–that he’ll receive in two years. That’s patience. The second way I meet EV drivers is at charging stations. While most of my charging happens at home or at my six-slot office charger, I had a fine conversation with two Leaf drivers in front of the Whole Foods recently. A fellow auto journalist drove to meet me for lunch in his EV test car, and showed me where he went to plug it in while we were eating. There’s lots of EV action online. I belong to the Fiat 500e group on Facebook. For now, I have a car to show photos of, and stories to relate. So do they. There are proud new car photos, oddball charging shots, and interesting customizations. One guy installed new, more powerful, but less energy-consuming, headlamps. Another posted a shot of his little Fiat next to a giant Chevy Suburban. I had recently taken a very similar shot of my colleague’s orange 500e next to the same kind of behemoth, and posted it in reply. We have fun. Of course there are numerous websites to visit, too. And on Twitter, I post links to this blog, and have picked up a bunch of folks to follow–and who follow me–by going there. I was expecting more camaraderie between EV drivers on the road, but so far, no-one has waved to me from their car. I, of course notice all of them. Maybe they just like not buying or burning gas and aren’t the social type. More (electric) power to them. I did look around for an actual car club, and found the Electric Auto Association. They have various chapters, but from what I can tell, they are the old-fashioned kind of organization. These are the techie guys who used to install dozens of regular car batteries in an old Honda Civic years ago. They are hands-on, and less of a purely consumer group–although I bet that’s changing. If it were September, I could participate in National Drive Electric Week, but who knows what I’ll be driving by then? I may own my own EV by the time any local events start on September 10. I love the social part of being an EV driver. Perhaps it’s the excitement about doing something special that brings some folks together like this. When you drive an electric car, you fit right into the flow of traffic, and especially if you own a model that also has a gas version, you may be invisible to the other drivers. But YOU know you’re battery powered, and that it all makes a difference. Someday, it’ll be the norm. Today, my wife and I took a trip about 11 miles away to a familiar shopping center. Her goal was eyebrow plucking. Mine was sitting and reading, and investigating a new charging station situated in front of the new Whole Foods grocery. I’d seen it before while shopping and felt it was a good use of my wait time. I drove up to the nrg eVgo charger and stepped out to see what it wanted for me to use it. I’m most familiar with the ChargePoint charging stations, as they’re located at my office, and the Blink Network, which I’ve used occasionally. This new one had two boxes with charging cables hanging on them. The one I approached had two next to each other, one being a quick charge and the other looked like a level 2 charger. Based on that impression, I called the number posted there and tried to set up an account. I gave the man my name and specifics, and he told me I could use a number he’d provide via email to log in to their website and finish the process. He also said he could give me access right away for today. Great. I reached for the cable, and when I pulled it out, saw that it was the OTHER kind of quick charge plug–the SAE Combo (CCS) type. The other one was a CHAdeMO version. Because my car didn’t have a quick charger, I was out of luck. Luckily, I was just doing research and didn’t need the charge to get home, but I never got that confirming email from eVgo, so I guess we’re not going to be doing any business for now. I understand that a quick charger is great for visits to the grocery store, rather than a slower Level 2 style, but it pays to check carefully before parking and hoping. I did learn from the company’s website that they have other locations nearby with (they say) Level 2 chargers available as well. It’ll be interesting to see if this company grows and become handy quickly. The other two charging cables, by the way, were plugged into the noses of Nissan Leafs, which do have the CHAdeMO charger. Choices. It’s what everyone is thinking about now, as we plunge headlong into the 2016 Election season. No matter which side you’re on, you have to agree that the people who support each candidate are often vehement about it. People are deciding, and it’s early, but you could say that they are choosing with their hearts and not their heads. He or she is MY CANDIDATE, which means the other candidates are stupid or totally misguided. At least it looks a lot like that to me. Regardless, when people go out car shopping, they are bringing all their old habits of living and thinking along with them. They may have practical concerns, but car buying is still an emotional process. And that’s why most people don’t go out shopping for electric cars. The best reason to buy and drive electric is to protect the planet from the worst effects of climate change. Not burning as much carbon is better. There may be some arguments against this, but they are not coming from anyone who is informed about the situation we’re in. Besides removing the combustion under the hood, electric cars are smooth and quiet. And, they deliver surprising torque from the get-go. The cars need next to no service, too. Forget oil changes or radiator flushes or hose or belt repairs. They cost less to run. Nice. So, where’s the rub? Well, you can’t get some of the electrics everywhere. I live in California, and there are plenty here. And, the prices can look expensive. But with great leasing deals, that’s a non-issue. Driving range can be seen as a concern, but if you have one internal combustion car in the family, it doesn’t have to be. My life of 36-mile-round-trip commuting and local errands perfectly suits Fidelio, my blue Fiat 500e. What about charging? Do you need to look for chargers and doesn’t it take a long time.? Well, yes, it does take a long time, but if you use Level 2 (240-volt) chargers, it’s much less. But, as a long-time expert in EVs told me, you charge the car while it’s just sitting, doing nothing. It’s no big deal. I normally charge Fidelio at work, and he’s done by lunchtime. Then, I go park him elsewhere, freeing up the charger for the next person. The time to do that is the time I’d spend in a gas station. Granted, it may be more often, but it’s completely manageable. So, what’s the deal? Maybe it’s just that many people don’t know how great it is to drive an electric car. So… If you have one, take out your friends and family! 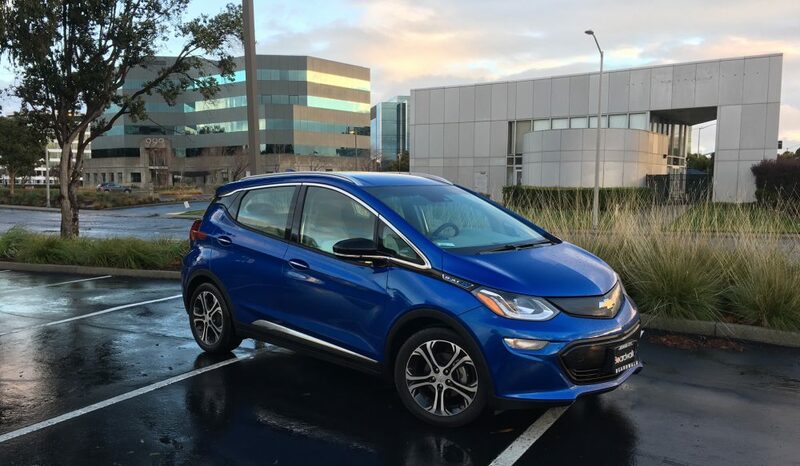 Give them a chance to see your EV in action. Joel Levin, of Plug-in America, says exactly that. Make it a viral experience. You show your neighbor, who then buys one. Then, the neighbor’s cousin visits and buys one. It takes knowledge and experience to recognize the benefits and pleasures of EVs. And if a pure EV is simply too much, say for a young couple in an apartment who need one all-purpose car, then look at the vast number of hybrid options. It’s up to us to do something. Choose wisely.